Sometimes one has a piece of jewellery or an accessory that is damaged but it seems a pity to throw it away. With a bit of imagination it may be possible to give it a new life. I had a necklace featuring an attractive piece of mother of pearl shell. The problem was the clasp had broken. Now I could have carefully attached a new clasp but the 'chain' made of little beads and tiny bits of wood was short. It would have broken again quite quickly due to the strain on it each time I did it up or undid it. 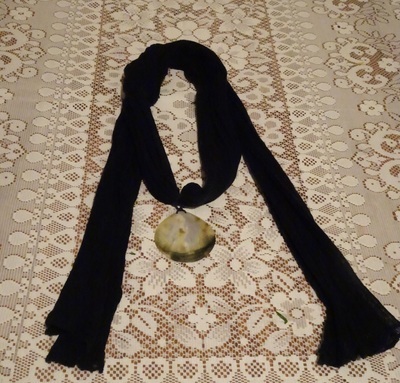 It occurred to me I could remove the pendant and attach it to a plain black scarf I already owned. So, I removed the pendant, retaining a short piece of the leather cord which the beads and bits of wood had been threaded onto. I then attached the pendant to the midpoint of the scarf. My 'new' accessory will get more use than the unadorned black scarf and has given the broken necklace a new lease of life. What's more, it's one of a kind.